This weekend was Pirate-Kart-V and Mini Ludum Dare #32. I was more interested in the Pirate-Kart, a collection of currently 700+ indiegames to send to the Game Developers Conference, but the date made it possible to make something for both events. 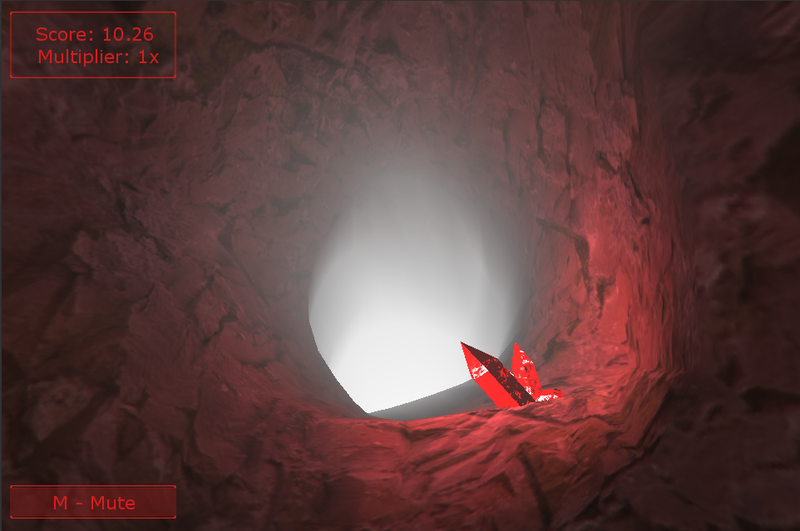 I created Vertical Void, a game about exploring a cave-system and trying to get as deep as possible. – Automatic procedural awesome level-generation! – Highscores! To see how well/horribly you performed! Right now the highscores on Kongregate are borked. I’ve worked for 23 versions on it, and I’ve come to the conclusion that my code is correct, and the error is on their side. Oh well. I’m getting the hang of the procedural level-system I previously used in Dirt Driller (spiritual predecessor), and again learned a lot. It’s actually a bit scary seeing how easily I handle things that would’ve confounded me just a year ago. Considering the largely unused subject-matter, there should be more games with an “ecological” setting. Recently several games came out in a short time that tackled this subject. And while every game is different, and approaches the theme differently, it’s still interesting to compare them. They always go for San Francisco first. In the future the remains of humanity live underground, but even that existence is in danger. To save the planet a team of scientists is sent back through time to reverse the apocalypse. Of course everything goes wrong and most of your team dies. It then lies up to you to join forces with a Scandinavian scientist and stop greedy industrialist from starting the inevitable downfall of humanity. 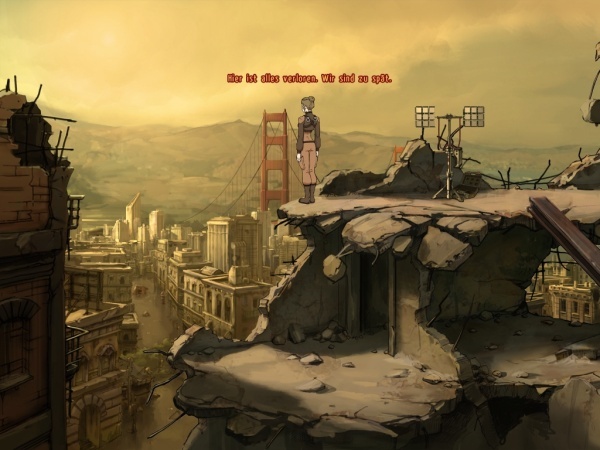 A New beginning is classic point+click-adventure. You control a character around by clicking on stuff. You talk to people to learn information and solve puzzles to advance. How is change on the environment represented? Traveling through the time-periods you visit several stages of deterioration, although it’s mostly “right now” and “post-apocalyptic”. 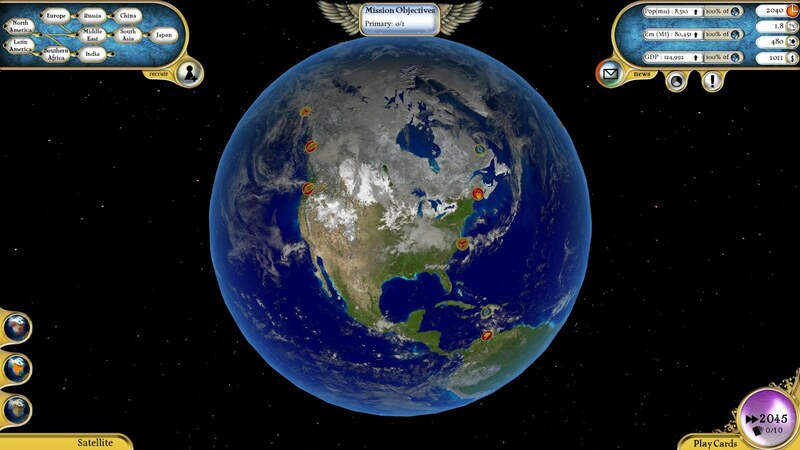 Later levels take place right before the cataclysm, which are fittingly located in a nuclear power-plants and oil-rigs. It’s good. That is, if you’re ok with point+click-adventures. This is one of the “dramatic” ones, compared to the “anarchic” ones like Sam + Max or Monkey Island. After suffering severe environmental disasters world governments unite under a single banner to stop the coming enviro-pocalypse. As leader of this organization it falls to you to stop the pollution while making sure countries still can develop technologically. Your main action in the game is passing edicts via playing cards, which usually influence several other factors and have unintended consequences. Halt the development of nation so that their emissions will not plunge the world into smog? Turns out they don’t like that and will rebel. Submit to their demands and raise the economic standard? This also means they’ll spew dangerous chemicals. Switch to nuclear energy in a plan to reduce greenhouse emissions? Turns out nuclear fuel is limited, and in a few decades you’ll be without energy. Also, that reactor looks somewhat wobbly. Better take a step back. The main screen during the game is a spectacularly beautiful view of the world. Whenever something goes wrong (which it will), a hotspot shows up, many of which will litter the screen with your failures. Events are portrayed by drawn vignettes, which show major effects. Sadly the world itself doesn’t change much. Yes, but it is quite difficult, a bit newcomer-unfriendly and slow. The polar caps have melted the sea-levels have risen, causing continents to become islands. 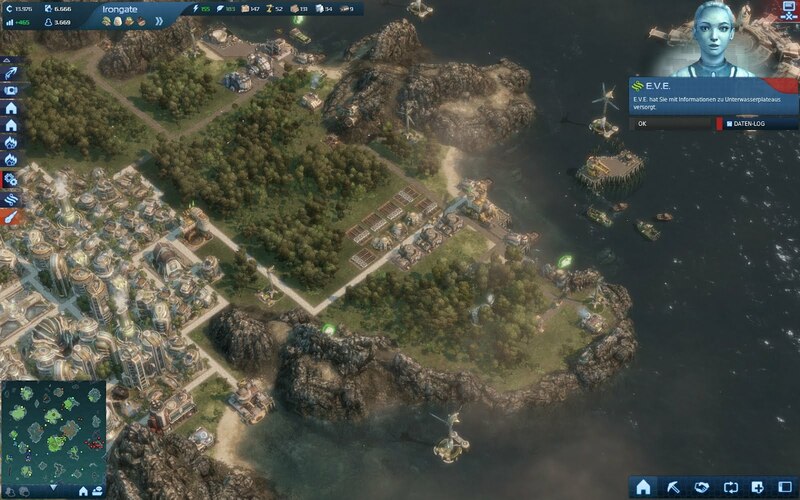 On these archipelagos you can create a settlements and keep their inhabitants save and happy. This can be done by either working with the Ecos or the Tycoons, who either preserve or ignore the environment. You create a settlement on an island. Your people require various items (food, cellphones, etc) to be happy and multiply. Over time the needs get increasingly complex, forcing you to settle other islands to get the resources and to trade with various NPCs. Environmental effect is measured on a simple slider. Many necessary buildings have a negative effect on the vegetation, which can be offset by building special counter-buildings. If the enviro-slider is positive enough you get a bonus on farms and happiness, there is no downside however. The color of the vegetation of an island changes accordingly, and does do in a beautiful way. Look at an island of the smoke-belcher-faction and you see grayed-out plants and grass, while factories darken the sky and machines rip open the ground. While only mildly effective, there are a lot of minor details that show both the major parties differently. 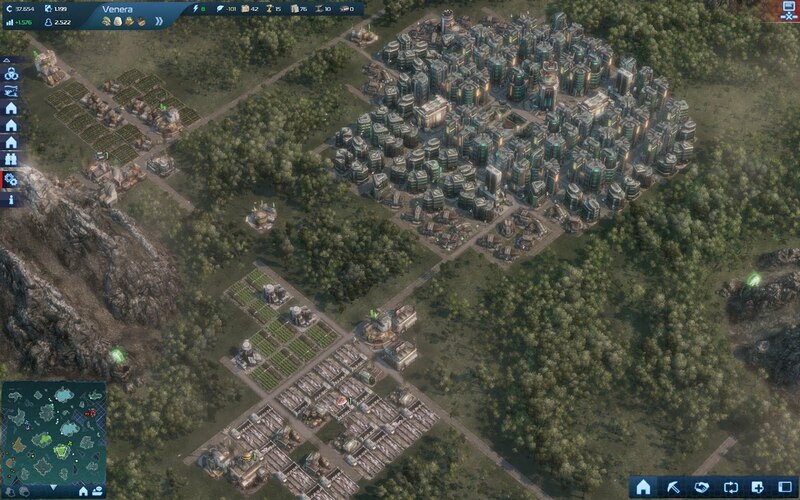 While the Tycoons can easily build their farms in grids, eco-structures are placed much more organically. Tycoon-NPCs offer more quests that deal with destroying and smuggling stuff. And while these changes are mostly optical, they are the most effective in terms of presentation and relate-ability. Smoking towers = bad. Yes. It clicks right into the lego-building-mechanism and is thoroughly satisfying. Unfortunately these games haven’t set off an avalanche of eco-games, and others are extremely rare. I hope this subject-matter will be further explored, because it is something underused, original, and most of all, deserving of exploration.